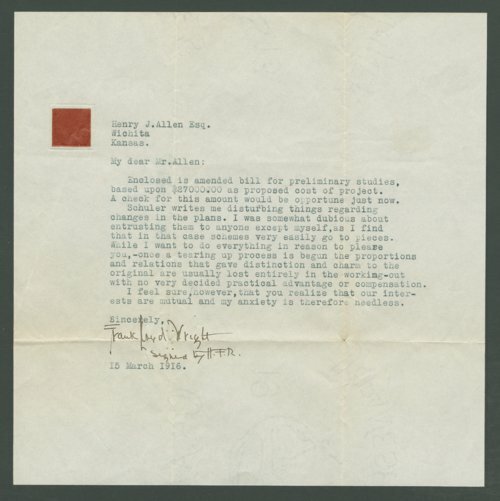 This series of sixteen letters to 21st Kansas Governor Henry J. and Elsie Jane Allen are sent from Frank Lloyd Wright and his third wife, Oligianna. In 1915, Allen hired Wright to design and build a house for him and his family on Roosevelt in Wichita, Kansas. Wright designed the building and relied on others to manage the construction of the house which was completed in 1918. Letters from 1916 to 1917 cover topics relating to the design and construction of the house, and the latter letters are correspondence between friends.